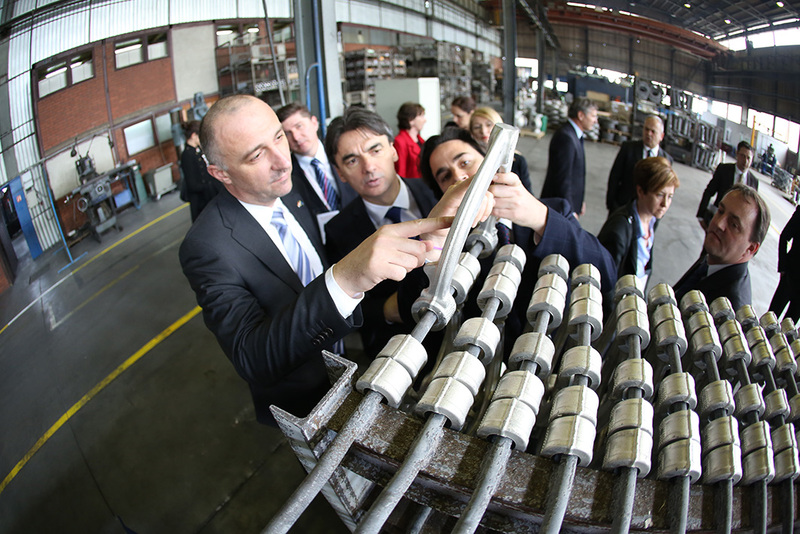 Slavonski Brod, April 10th, 2013 – Today, Saint Jean Industries, a France based company opened a new production plant at a ceremony held in Slavonski Brod. Deputy Prime Minister and Minister of Regional Development and EU Funds, Mr Branko Grčić, Minister of Economy, Mr Ivan Vrdoljak and the Managing Director of the Agency for Investments and Competitiveness, Mr Damir Novinić participated in the ceremony. Saint Jean’s new investment in Croatia amounts 5 million euros and when the new production plant starts operating, 80 new employees will be employed. Investments will be dedicated to metal processing sector, i.e. the construction of a new production plant for the machining, assembly and testing of compressor housings for the car turbochargers. This completed by a new logistic warehouse will represent an additional 4000 sqm. Saint Jean Industries d.o.o. operates in Croatia since 2004 and currently employs 230 people and with an annual revenue of 11,5 million euros in 2012, and a sales forecast of 16 million euros for 2013. The whole Saint Jean Industries Group employs 1800 people and its 2012 annual revenue ended amounted to 210 million euros. Agency for Investments and Competitiveness has been involved since its establishment in the realization of the Saint Jean Industries’ investment, providing an all-encompassing operative support. “Working Group for the Business Climate and Private Investments, as part of the Coordination for the Economy, Investments and EU funds, works daily on removing obstacles to investments, i.e. by dealing with concrete problems and finding adequate solutions on case by case basis. And, consequently, today, in Slavonski Brod, we are able, and pleased, to present first outcome of our Working Group and to welcome investors from France who are present here to open the new production plant. We would like to congratulate the Saint Jean Industries group and to thank them for recognizing that Croatia is a country where it pays to invest and expand the production. Croatia has a long tradition and expertise in metal-processing sector, it has the people who know how to do the job. I constantly emphasize: investments are key to economic recovery. These are investments that the Government supports and wishes to bring to the Republic of Croatia. New production plant, new machinery and equipment, new added value to the Brod-Posavina County, to the City of Slavonski Brod but also to the Republic of Croatia as a whole, and, what is most important – new workplaces. Working Group for the business climate and private investments is currently working on removing obstacles to the realisation of 14 projects worth around 930 million euro. Out of these, the obstacles have been removed for four projects worth about 153 million euro, including this one in Slavonski Brod, which created 770 new jobs. Soon to be resolved are further four projects worth around 75 million euro. 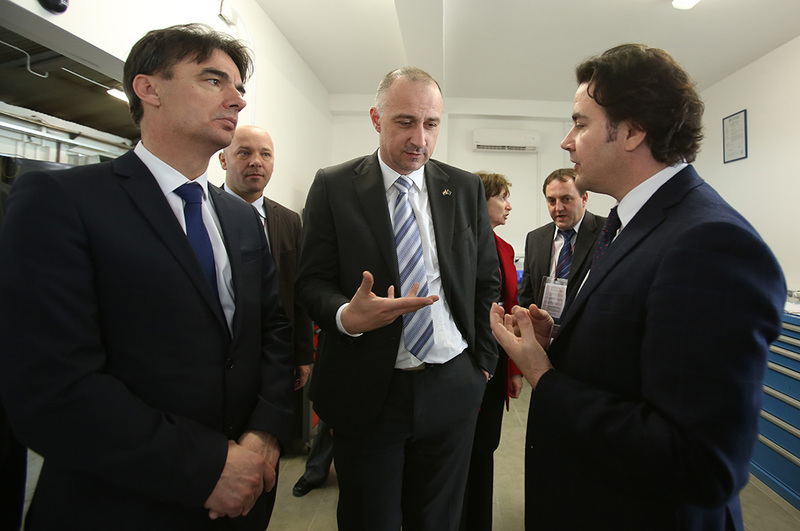 I invite all investors who have problems in the realization of investments to contact the Agency for Investment and Competitiveness – said the Deputy Prime Minister and the Minister of Regional Development and EU Funds, Mr Branko Grčić at a ceremonial opening of Saint Jean Industries’ new production plant in Slavonski Brod. „We are always very pleased when new production facilities at the highest technological level are being opened, as in today’s example of Saint Jean Industries. Croatian Government and the Ministry of Economy, together with an investor, have actively participated in the realization of this project and have proven that investments in our country can be achieved in the shortest possible time. After just a few months, all prerequisites for the start of a new production plant, an investment worth approximately 40 million kunas and creating 80 new jobs were set. These kind of investments are exactly what we need in order for our economy to recover as quickly as possible, as well as to achieve economic growth and ultimately to provide a better life for all Croatian citizens. We are pleased that the company Saint Jean Industries recognized Croatia as a country with a favorable business environment, and we will do everything in our power in order that other investors follow suit and recognize the investment potential of our country. This project is a good example of cooperation between foreign investors, the Agency for Investment and Competitiveness, City of Slavonski Brod and the Ministry of Economy. Croatian Government and the Ministry of Economy will do everything in their power to facilitate and shorten the path to the final realization of investment projects for all investors, and particularly for those in the manufacturing, and in doing so to also create new jobs“-said the Minister of Economy Mr. Ivan Vrdoljak at the grand opening of a new production plant from Saint Jean Industries in Slavonski Brod. “I want to thank the team of the Ministry of Economy, the City of Slavonski Brod, our local bank partners, especially HBOR, our customers who bring business, and our employees here in Slavonski Brod who did and are still doing a great job. 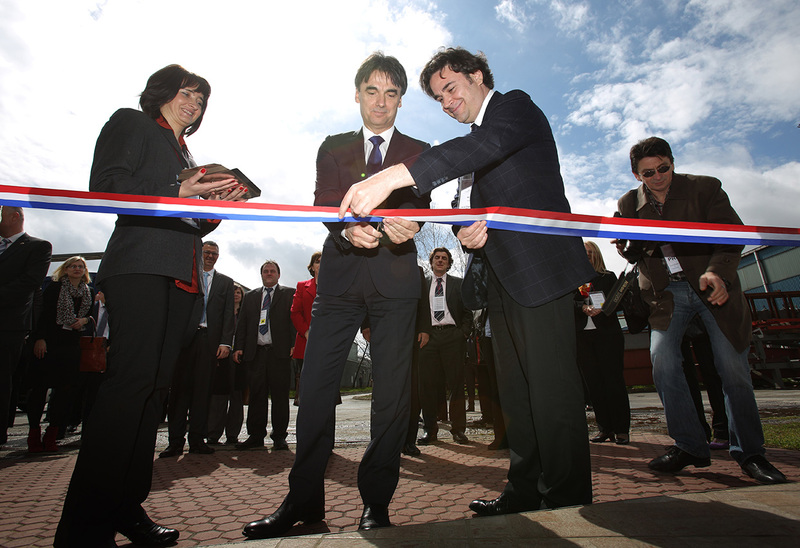 It is already a decade since we first decided to invest in Croatia. Since then, we are very proud to have built what I consider to be a state of the art aluminum component supplier, not only for the automotive industry but also for diverse industries like the electrical construction and transportation together with ALSTOM and POMAGALSKI. We started subcontracting to Saint Jean main company in France but got Slavonski Brod site to be working directly with customers as an independent company. When Saint Jean group invested in Croatia, we not only aimed a skilled workforce but also an environment conducive to the development of our company on a long lasting business. We believe we are part of the Croatian economical community now and feel the interest and support from the city up to the government level. It is always easier to build on a solid basement and that is the reason why we want to increase our activities in Slavonski Brod. This extension will allow Saint Jean Industries to step to a good size site aiming 30M€ in sales with a brand new, modern and efficient ice infrastructure. It will reinforce customers’ confidence to work with us. We look forward to the near future integration of Croatia in the European Community”, concluded Mr Emile-Thomas Di Serio, the president of Saint Jean Industries’ group. “The fact that Saint Jean Industries group decided to expand their production capacities to SE Europe, Croatia and Slavonski Brod makes us extremely proud. Geotraffical position of Slavonski Brod makes our city attractive for potential investors. At the same time as Municipality we did everything we could to ease the process of developing their business plans; Slavonski Brod has all the necessary infrastructure and locations where great ideas can become a successful business. This new production plant confirms that. We wish all the success to Saint –Jean Industries group`s new production plant. At the same time we wish this project to become an example for all the potential investors interested in investing in Croatia and Slavonski Brod”, added Dr Mirko Duspara, the mayor of the City of Slavonski Brod.